Ladies, have you ever wanted to become more feminine? There. Now that you’ve pulled up a chair, I’ll tell you a secret. For most of my life, I’ve been a workhorse. My family went through some tough times financially, and we learned to make do. We lived on a small vegetable farm, and we had several acres of land, so we filled it with vegetable plots, orchard, and vineyard. We grew beans, potatoes, squash, greens, berries, etc. When I was old enough to be useful, I started working on my dad’s construction crew. I picked up trash, mixed concrete, painted, hung insulation, hauled block, and shingled roofs. When I wasn’t in school, and in evenings and weekends, I worked. I am grateful that my parents taught me how to work hard. I wouldn’t be where I am today if I hadn’t learned the value of work. Because I worked so hard, I’ve learned to be passionate, driven, and focused on my dreams. But because I worked so hard, I never learned about refinement, grace, or femininity. Wearing makeup, lipstick, nail polish, etc. Then I started reading Becoming God’s True Woman by Nancy DeMoss, and Ms. DeMoss messed with my theology right away. … when God created the first woman, he made a fully feminine creature. You and I did not become feminine because someone gave us a doll and put a dress on us–we were born feminine because we were created feminine” (page 25). I saw the truth in her statement right away. Don’t you? I had never thought of it myself, but it makes sense. God made me and you. He made us women. Being feminine is who we are. I don’t have to try to become feminine. I don’t have to reach for some pinnacle of “girlyness.” I don’t have to start liking feather boas, tiaras, and mascara, if I don’t want to. I can just be me, because God made me a woman. He made me feminine. I can relax and enjoy being who I am. So I was challenged to rethink my approach. I changed my goal from wanting to become more feminine, to just wanting to look my best. And when I changed my perspective, it became easy and fun. I bought some dresses that fit. I wear them, too. I bought some new nail polish. The great cloud of witnesses fainted when I put it on. I dug some lipstick and eye shadow out of my drugstore-game stockpile. I cleaned up a little, and instead of dreading it, I actually liked it. Looking my best was suddenly easy, because I wasn’t striving. I was just being who Papa made me to be. Have you ever felt inferior? Have you ever felt like you weren’t feminine enough, beautiful enough, or “put together” enough? Have you ever compared yourself to other women, and wished you could be a little bit more like them? If so, Papa God wants you to know something: You don’t have to compare yourself anymore. You are beautiful. He made you a woman. Everything ladylike, and refined, and beautiful is in you. You are lovely and mysterious and elegant, even if you don’t feel like it. You can just relax. Enjoy who you are. Let yourself embrace the femininity that your Papa God made you with. 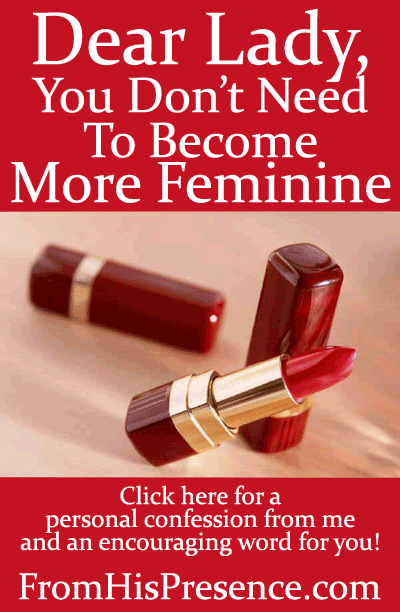 You don’t have to do anything to become more feminine. Being feminine is who you are. 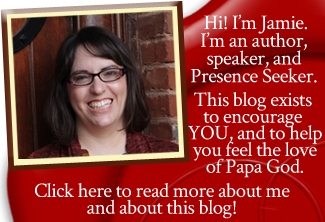 You’ll get my free, printable blessing cards and my ebook–The Presence Seeker’s Creed–for free when you confirm! Hi Jamie. I can totally relate to what you said above. I have always struggled to be a “girlie girl” and I never had a dad around to make me feel like a princess, I grew up a bit wild and I liked boys things and martial arts and motorbikes in fact I still ride a motorbike and like to do mens work and use power tools 😀 I don’t do the martial arts stuff though. I have just had to accept that I am the way I am and Father loves me. I do dress up occasionally and I sometimes like to wear dresses but I just think of the practicality most days lol.